Prize Pool: $401,580 | Entrants: 414 | Congratulations to Daniel Silva for winning $91,557 and the $3,500 Championship Package! From almost the first hand of final table play, it was the Hyndi Khomutetsky Show in the Heartland Poker Tour (HPT) Main Event from Daytona Beach Racing and Card Club. Khomutetsky, a regular at both Daytona Beach and Orange City card rooms, was running over the HPT final table. Starting the day only a few bigblinds behind chipleader Daniel Bekavac, Khomutetsky began amassing chips fast, took a huge pot early on from Bekavac and never looked back. By the time 6-handed play beganshe had more than half of the chips, and it looked as though everyone else was playing for second. Then there was Daniel Silva, another regular at the Daytona Beach card room. Silva stayed out of trouble through most of the rapid-pace of the final table's early action. He gathered steam later by eliminating Ossama Estafanous, Tony Armand and Chris Poole. Knocking out the players in 4th (Armand) and 3rd (Poole) helped him cut in to the chiplead of Khomutetsky before heads-up play began to a 2-1 deficit. Silva doubled once through Khomutetsky after about 45 minutes but was never able to get closer than that 2-1 disadvantage in chips during the first 90 minutes of heads-up play. Coming back from a 15-minute break, however, saw the tables turn and wow did they turn fast. First there was a full double for Silva with a straight to cut Khomutetsky's chiplead to 5-4, followed up quickly with a 3.9 million pot Silva took down with top pair to King-high for Khomutetsky. The final hand saw Khomutetsky moving all in on a board with a straight draw. Silva called with top pair and held for the win, just three hands after getting the chiplead for the very first time. Silva earned $91,557 and a $3,500 HPT Championship Package for the victory. He defeated Khomutetsky in a heads-up match that lasted two hours. Khomutetsky cashed for $56,527 as runner-up. Former HPT champ Roger Campbell was the first player out at the final table ($8,917), with Barry Gallaher out shortly after ($10,549). Bekavac - who lost almost every hand he played against Khomutetsky the last two days - went out in 7th, ($12,739), followed by current HPT Player of the Year leader Estafanous in 6th ($15,326). Corey Zedo made back-to-back HPT final tables, finishing 4th at Black Hawk four weeks ago for $47k. He followed that up with a 5th place in Daytona Beach for $19,705. Poole made the most of the least. He was all set to be eliminated late Sunday night, all in for his last 2BB with 10 players remaining. His 6-5 offsuit flopped a pair and he made the Monday final table, then found three double-ups in early final table action. He parlayed that run to a third-place finish and a $37,619 cash. With his 6th-place finish, Estafanous extended his Player of the Year lead to 23 points over Jake Baumgartner - who finished as the TV Table Bubble, a 10th place in Daytona Beach. 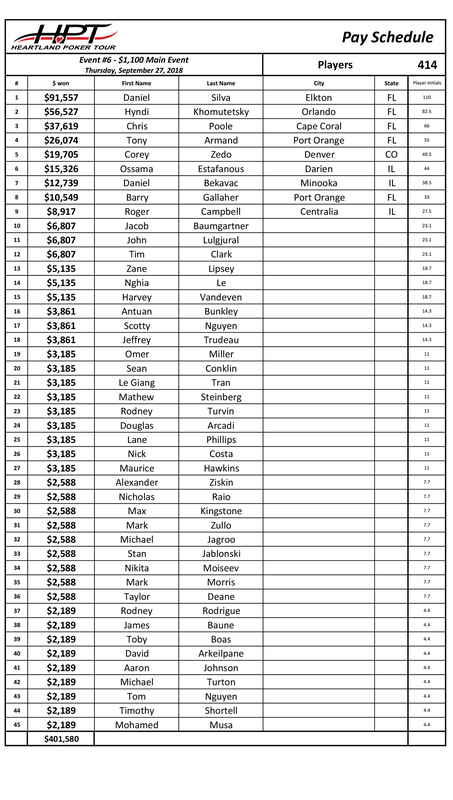 The Nov. 9-13 HPT Season Championship $2,500 buy-in at Ameristar East Chicago is the last tournament to earn Player of the Year points. Others who cashed at Daytona Beach included Scotty Nguyen - celebrating his birthday with a 17th place finish - Maurice Hawkins (27th), Alex Ziskin (28th), Stan Jablonski (33rd), Mark Morris (35th) and Aaron Johnson (43rd). Opening in 2008, the Daytona Beach Racing and Card Club is a contemporary, award-winning, entertainment complex. This unique, 53,000 square foot, LEED Gold Certified gaming facility features a plush poker room, live Greyhound races, wall-to-wall LCD flat screen televisions, personal betting screens and private betting carrels. Enjoy the excitement of simulcast wagering on Jai-Alai, Thoroughbred and Harness Horse racing, and Greyhound Races from top-flight tracks around the country in comfort and style. A genuine hotspot for poker activity, Daytona Beach has the distinct honor of hosting the only stop in the state for the internationally televised Heartland Poker Tour, as well as year-round national and celebrity tournament events at our poker room and card club. 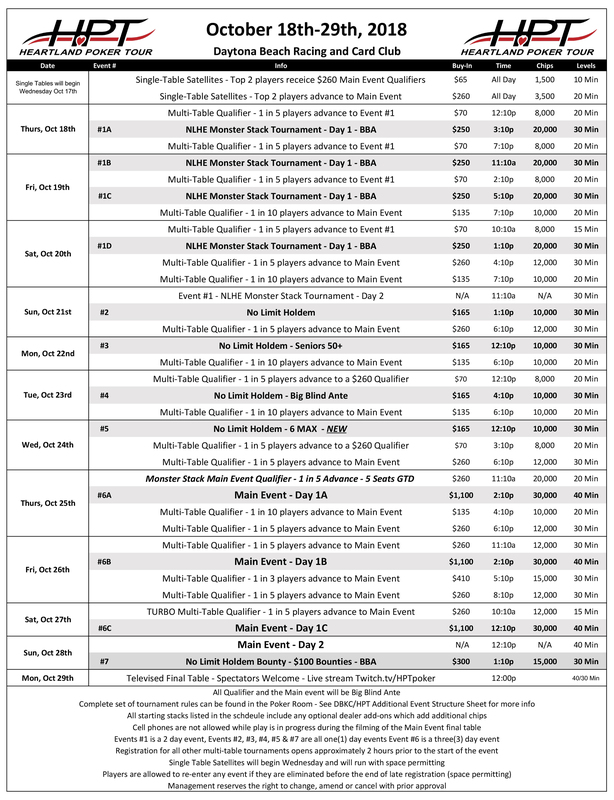 Daytona Beach Card Club offer up a variety of table cash games including Texas Hold'em, One Card Poker, Three Card Poker, and other poker games alongside high hand promotions.Our deluxe 55-table card room presents poker enthusiasts with a variety of poker game options, perfect for any skill set. Try your hand at Texas Hold’Em, Omaha Hi-Lo, or Seven Card Stud, and test your talents in daily cash games and tournaments or a variety of high stakes cash games. While you focus on winning, we’ve got you covered. You won’t have to miss a hand as you enjoy the convenience of Poker Room food and beverage service, or indulge in a tableside massage! Quality Inn is located two miles from the Card Club and they're offering exclusive rates to HPT players starting as low as $71/night! Click HERE to make your reservation today.